The pedigree of Caesar Guerini and Fabarm USA has been great-looking shotguns, with an emphasis on clay target sports. Fabarm, in the United States, introduced the XLR5 line with the XLR5 Velocity: 2-3/4 inch chamber, target rib, target trigger, adjustable rib, adjustable comb, adjustable trigger, adjustable balance, integrated recoil reducer . . . adjustable almost everything, with hand-oiled walnut stocks. In the United States, their autoloading line has grown from there with several more Syren and Fabarm models. Some folks prefer synthetic, for they feel that models like the L4S Deluxe Hunter are too pretty to hunt with. If you are over forty years old, you might feel that walnut is preferable for everything. However, if you are younger than forty years old, composite (okay, plastic) stocks may well be your choice. Certainly, although oars are made from wood as well, many duck hunters far prefer to paddle with plastic, and the walnut Automatic-Fives that were the “do everything” shotguns of yesterday are not the do everything shotguns of today. My version of a “do it all” shotgun is a shotgun that you can have a good time on the clays course with, without getting beat up, yet works just as well in the duck blind, on the dove field, is “steel shot friendly,” and isn't so ponderously heavy that you dread carrying it for wild pheasants, either. The Fabarm XLR5 Composite, well established throughout the world for several years, is that gun and is finally available in the United States. For now, it is offered in the United States in one flavor: with a 28 inch barrel and in basic black. My example weighs 7 lbs. on the nose, with a trigger that breaks at a measured 4 lbs. 4 oz. It comes with shims, it comes with metal sling studs you can install quickly if desired, and it all comes nicely presented in a zipped semi-hard case. It also accepts Weaver bases if you'd like to add optics. You also get five Exis choke tubes, and all of them are steel-shot rated: that includes their full and extreme full chokes, something no other manufacturer has. The Tri-Bore barrel is proofed to 1630 BAR, the highest of any production shotgun, you also get a written 5 year warranty. Service, if needed, is provided by the Caesar Guerini / Fabarm team of factory-trained gunsmiths, not some mysterious warranty center. The rubberized “Soft Touch” stock is an upgrade from common hard thermoplastic stocks, and the 22mm factory recoil pad does a very good job as well. Like all Fabarm 3 inch chambered hunting autos, it can handle 1-1/8 oz. loads up to 2 oz. loads, whether lead, steel, tungsten, or whatever. Fast 1 oz. loads cycle flawlessly as well. While Fabarm publishes a 14.75 inch length of pull, https://fabarmusa.com/xlr-composite/ my tape measure says it is 14-1/2 inches, the same as the XLR5 Waterfowler. There is one added feature on this shotgun that has me stumped, although I am quite easily stumped. That is the green insert at the rear of the receive, shown above. In actual shooting, I don't so much as notice that it is there at all. Fabarm advises me that the green insert is there to aid in sight alignment in low light, but I'm not buying that and if it was up to me, it wouldn't be there at all. The front sight is a small red tubular fiber-optic bead, a very good thing as far as I'm concerned as many front beads are far too large for my tastes. The XLR5 Composite is well-balanced, shoulders easily, and is a soft-shooter just like all Fabarm gas-operated autoloaders. As T&S makes a hull catcher for the XLR5, this shotgun is a fun choice for casual trap as well. Like all Fabarm hunting autoloaders, it shoots to point of aim at 40 yards. The design of the XLR5 is ideal as a wet-weather waterfowl gun: as there is no crud-collecting mainspring tube or mainspring in the buttstock, you could actually paddle away (with the buttstock) and the gun is unaffected. 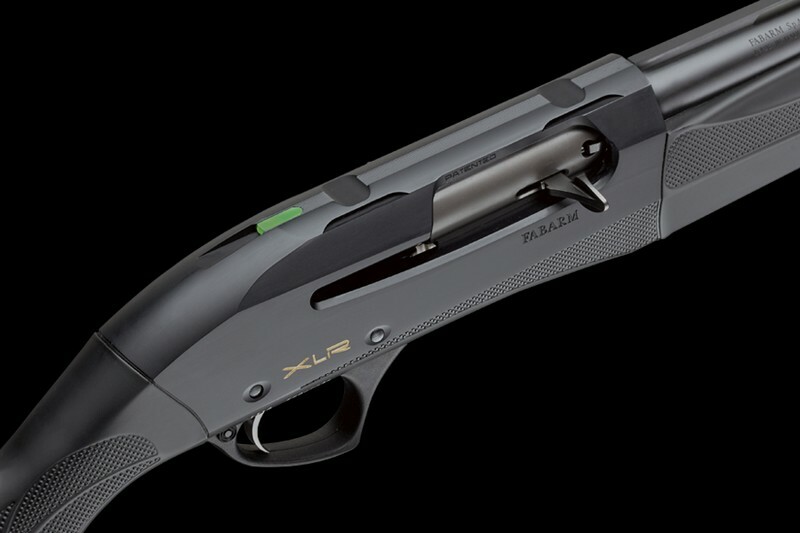 If you want a better composite stock than most, a better trigger, a higher grade of barrel, better factory choke tubes, a better level of bluing, a better warranty, and better customer service than most: the XLR5 Composite is about the most you can get out of a 12 gauge all-around, multi-purpose, all-weather autoloading shotgun without having to buy a second gun. It is never a bad idea to practice with your hunting shotgun, and with the XLR5 you can do it extremely enjoyably and comfortably.